Metal Coupler made from 3.0mm pressed steel, these connect the anti climb fence panels together. Can also be used on galvanised crowd barriers. 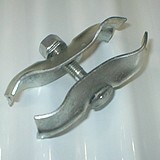 Recommended two couplers to connect two anti climb panels together.